If your device has a connector that is meant for The Segger JLink programmer, you can find the pin layout at https://www.segger.com/jlink-adapters.html#CM_9pin. The default programmer with the Nordic development kit comes with the J-Link 9-pin Cortex-M adapter. The first one is optional! It does not provide power, it is used to measure if the target board does have power. The ST-Link programmer is not easy obtainable, just as the J-Link programmer is actually hard to come by as a separate product. For that reason it is worth to check into the STM32FDISCOVERY board. 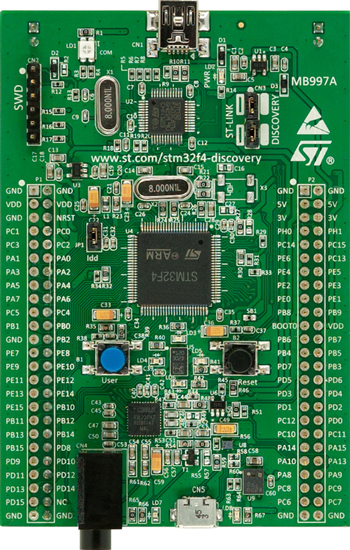 You can get the STM32FDISCOVERY at Mouser for € 13,47. This board is anyway fun, it has a lot of GPIO (pins) and it has an ST-Link on-board. On the STM32 board you see a connector with the label SWD. We need to pins from there. From the top (where there is the USB connection), we need the second pin and connect it to SWCLK. From the top we need also the fourth pin, and connect it to SWDIO. Use something like a logic analyzer to see if you do things wrong. This is a very, very useful tool that can save you a lot of time. Normally the Crownstone we program with the J-Link from Segger, but if you want to use this cheaper solution, we also created some files for you at the BlueNet repository at github. You have to adjust that file on the moment manually to switch between softdevices. You will see that there are several files on github that you can use. There is a 49-stlinkv2.rules file that you can use for udev so that no superuser rights are required to use the ST-Link. There is also an openocd.cfg file that sets the defaults for the hardware we are gonna use (the nrf51 series). This will upload the binary you have previously composed to the target. Ready you are! If your target does not have pins to break out UART, it might be worth to first try and start experimenting with the RFduino. That board has enough pins broken out, to see what for example the Crownstone code is actually doing. For example if you combine a SoftDevice with the wrong bootloader, you will see proper error messages. If you know how to hook up gdb over OpenOCD, please feel free to file an issue at https://github.com/dobots/bluenet/ and I will be happy to update this guide.